← Is much of current climate research useless? The geologic record shows the planet is in a rare ice age – only three in the past 500 million years, occurring on approximately 150 million year cycle -, perhaps the coldest for the past 600 million years (since the last Snowball Earth) . Almost no probability of temperatures reaching even the planet’s ‘optimal’ temperatures again for millions or tens of millions of years; (perhaps until after North and South America separate). Consequently, justification for abatement policies needs to be made on a purely cost-benefit basis, not on the basis of fear. Climate changes abruptly – always has, always will; i.e., not as smooth curves like the projections from climate models. Risk analysis should take into account the offsetting benefit of increasing GHG emissions reducing the probability, extending the time to and reducing the magnitude of the next abrupt cooling, which is what is due if not for our GHG emissions. 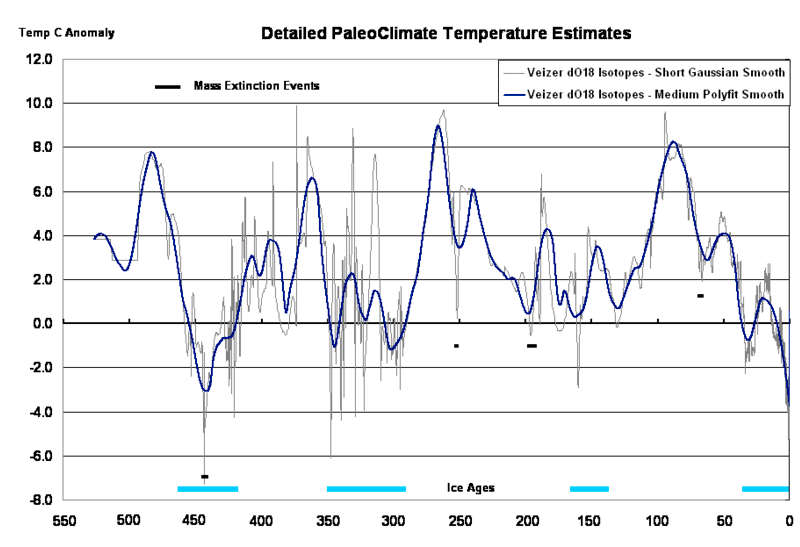 Peter Lang – All good stuff, but the bit about “the next abrupt cooling” doesn’t really belong under the paleo chart because they are on such different timescales and precision. Perhaps someone needs to do a detailed piece on the likelihood of a cooling and put it in front of tomorrow’s policymakers. (Today’s policymakers are blind). Note that all show that the planet’s climate is in an unusually cold period and near the coldest it’s been for the past 542 million years (approximately since multi-cell animal life began). There have only been two previous ice ages in the past 500 million years (i.e when there is ice at one or both poles) and we are in about the coldest. It is inconceivable that the average global temperature can rise catastrophically in hundreds of years – I suspect not ever (since life survived throughout the warmest periods and much of life thrived). black	dashed	line	in	Figure	10. Harland	et	al.,	(1990)	timescale	corrected	to	Ogg	et	al.,	(2008)	timescale. Only once before has it been this cold! What the ‘Phanerozoic Global Temperature’ chart shows is that we are in a very cold time. It is not credible to get to to warm times in centuries (or even millennia) no matter how much GHG we emit. The projections to PAW (19.8C) are based on calculations using a mass of alarmist assumptions (their worst case). And even with those they calculate temps at only the middle of the historical temperature range. 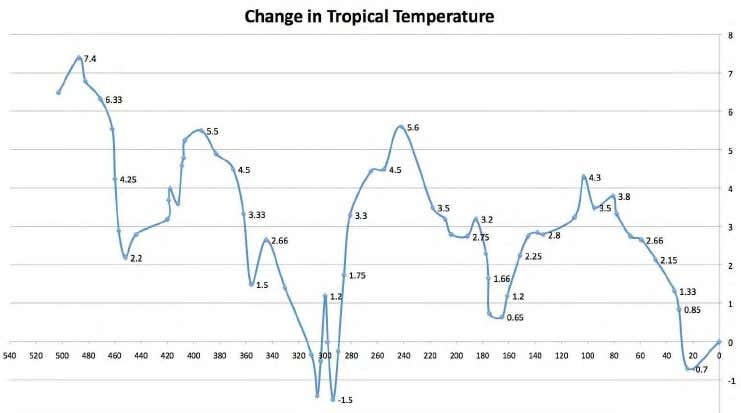 The ‘Tropics to Pole Temperature Gradient’ chart and the ‘Change in Tropical Temperature’ chart need to be interpreted together. Together they show little change in tropical temperatures, large change in temps at high latitudes and, for a 3C increase in global average temperature, the average temp at the poles increases from -36C to -7C. So, where is the evidence for catastrophic AGW? So far no one has provided a persuasive argument and valid evidence demonstrating that GHG emissions are dangerous. hothouse	conditions	have	predominated	(70%)	and	the	average	temperature	has	been	~21.5 ˚C,	a	pleasant,	70˚F. Also, there is an effort to educate the WSJ readership about climate change. Some education. Think what you’re told to. Don’t let fact get in the way of propaganda. CO2, like anything else, warms while the Sun shines. Like anything else, it cools when the Sun goes down, when the Sun is further away, or when your location is tilted away from the Sun. Things like winter being colder than summer don’t seem to impinge on the lunatic Warmist propagandists. A grain of truth, baked into a giant lie pie! Good luck with your ongoing “education”. Stupidity and wishful thinking, Jim D. Stupidity and wishful thinking. Where’s your falsifiable hypothesis about the planet heating effects of CO2. Can’t find it? With the missing heat, maybe? It’s a travesty! Jim – while I agree here more with you than with Mike, you should not attempt to over-simplify the situation. CO2 is not a thermal insulator in a classical sense. It merely prevents certain IR wavelengths from passing unobstructed. What happens next – a re-radiation, a conversion to heat, or a conversion of heat back to IR – is a complex and not very well described process. Thermal insulation is defined quantitatively in terms of the temperature gradient it sustains for a given outward energy flux, radiative flux in this case. It can be defined for the atmosphere or any insulation-enclosed object in space. I have no problem with the insulating properties of the atmosphere, or of the individual components of which it is comprised. The Moon provides an example of the temperature extremes of a body without appreciable insulating atmosphere, exposed to insolation at equivalent distance. As can be clearly seen, the absence of insulation results in both higher and lower extremes. On Earth, a diminished example can be seen in clear air conditions in arid tropical deserts. Higher daytime, and lower nighttime temperatures, due to greater insolation in the absence of insulating H2O gas, and higher radiation loss to space at night, for the same reason. I am slightly surprised that Warmists generally seem to have abandoned the “back radiation” nonsense, and have gone back to early Warmist explanation based on blankets and overcoats. Neither of which, of course, raises the temperature of a cooling corpse one bit. No heating from surrounding an object with CO2, either. You are correct, of course, with the ability of CO2 to absorb light of various wavelengths, and for its temperature to rise as a result. You are also correct to say that what happens after this can be complicated. As Tyndall showed, the usual result is that CO2 cools down when the light source is removed. This is noticed when the atmosphere cools at night, or if a container of CO2 is refrigerated – that is, allowed to lose energy by radiation. I apologise if I’ve not been clear, or have cut too many corners. Warmists seem to have cornered the market on incomprehensible dismissive mainly monosyllabic statements. I would appreciate any corrections if I have erred in fact. I have made some basic assumptions which I believe I can support, if you want me to. In essence I agree with the IPCC that predicting future climate states is not possible. Energy distribution within the Earth system is also impossible to predict with any more precision than a naive persistence forecast, except in very specific circumstances. Sorry for being long winded. No offense intended. “For now, let us also agree on the basic physics–that everything else changes and actual data does not support that more CO2 results in any measurable and provable warming.” Any measured change is smaller than the error range. PCT, right on. Jim – you say that thermal insulation is defined quantitatively for the atmosphere. Can it be measured? Has it been measured? Do results support your position? The units of thermal insulation are deg C per (W/m2) where deg C is the temperature difference supported for a given outward energy flux. For climate we can say that this is the 33 C difference that the atmosphere sustains between the surface temperature and radiative temperature at the top. The outward flux at the top is about 240 W/m2, so we have 33/240=0.14. This is an R rating of less than 1 in thermal insulation units. Not much, but we would be really cold without it. Magical 33 C again. Who has measured it? Is it the same at noon and at midnight? Cloudy or clear skies? Antarctica or Congo? CG, I am sure you realize by now that 288 K is the average surface temperature of the earth and 255 K is its top-of-atmosphere radiative temperature. Both numbers are quite solid, so yes it is 33 C, perhaps 34 C by now. Then the thermal insulation of the atmosphere varies over space and time. Why you can not measure it anywhere, you have a quite solid guess of the average. I forgot to ask – how high is the top of atmosphere? Does it, too, vary in space and time? You can establish a global insulating effect, which was the point of this. You did nothing like that. You don’t even know how high is the Top of Atmosphere above your head right now. CG, OK, then I did not understand your question about whether the atmosphere is a thermal insulator. It is, but maybe you think not. Explain. I was agreeing with Pope. Got a problem with that? What you wrote does not agree with Pope. Pope says the heat added by CO2 will be countered by natural climate responses and there will be no measurable warming that can be proved to because of increase in CO2. The upper limit of temperature is bounded because when earth warms, Polar oceans thaw and snowfall increases until earth gets cold again. Your words do not indicate that you have agreed with Pope. If you really do agree with Pope, then you are getting on a better track, but you need to learn more about what you are agreeing to. how high is the top of atmosphere? That is a grey area. The Skylab was above most of the atmosphere, but it fell to earth because it was not above all of the atmosphere. The Space Station gets re-boosted from time to time because it is not above all of the atmosphere. Does it, too, vary in space and time? YES, the top of the atmosphere does vary in space and time. OK, I wasn’t agreeing with Pope, but Pope was agreeing with me if you look for the original statement below where he said I was right. Seems to have changed his tune now. There is no such hard boundary and it is defined arbitrarily. 100 km seems to be the standard. Popes’, I suspect that your expectation of albedo response to warming is smaller than you think. You are probably neglecting the changes in convective transport and frequency of rain/snow fall response to changes in vertical IR profile for the GHG bands. Back radiation just helps you to see that the insulation is there. It doesn’t help you to quantify its effect because you have to see that from outside the atmosphere. However there is a one-to-one correspondence between back radiation and the insulation effect. You don’t get one without the other. The amazing heating properties of insulation, which has already prevented 23% of the Sun’s radiation from reaching the surface (according to NASA, anyway). It doesn’t really matter, does it? This miracle of insulation and back radiation only works while the Sun is shining brightly, and works better in summer. At night, in winter, indoors, or when it’s cloudy, rainy, smoggy, high levels of particulate pollution, or lots of H2O or CO2 in the atmosphere, it all works in reverse, and things cool down by comparison. But NASA employs Gavin Schmidt, noted mathematician and consultant communicator, so NASA couldn’t possibly be wrong, could it? What do you not understand about the statement you just quoted from NASA? Do you realize that solar radiation and back radiation are separate components of the radiative flux at the surface? The surface would be a heck of a lot colder without any thermal radiation from the atmosphere, but I don’t expect you to understand that either. I know you’re just pretending to be stupid, but the temperature on the surface of the Moon, after the same time of exposure, same insolation, get to approximately 107 C. No back radiation, no GHGs. The highest temperature at the Earth’s surface as a result of the action of the unconcentrated rays of the Sun, is maybe 90 C.
You were saying how GHGs raise the temperature of that which they surround? You’re just as much in reality denial as Schmidt, Mann, and Mosher. I include Mosher, because he has as much right to call himself a scientist as Gavin Schmidt, who also claims to be a scientist, in spite of having no scientific credentials, (apart from self assigned ones, of course). Dumb and dumber – all fuelled by James “Death Trains” Hansen’s pathological fear of coal. In his philosophy, it seems that all filthy, dirty, evil, black Coal Burners, will be consigned to being boiled alive in the waters of sin which will rise over them. Yea, even to their sons and daughters, and their . . . This is what happens when you let a lunatic lead you. You did the Moon argument before, and got it hopelessly wrong. Are you really trying again now? The Moon hardly rotates, so it is not easy to compare with Earth, but go ahead and try if you want. I will wait. CERES data is measured from outside the atmosphere it has not indicated a change in IR or Albedo while CO2 has risen a lot. So, the insulation has not changes a measurable amount while CO2 has changes a measurable amount. Your one to one correspondence throws the CO2 totally out of the temperature changing business. If IR and albedo are not changing, it means that the surface temperature is warming at the same rate as the forcing is increasing. It doesn’t mean warming has stopped. On the contrary, it is balancing the CO2 increase rate. Flat earth flynn. For the wynn.!! If IR and albedo are not changing, it means that the surface temperature is warming at the same rate as the forcing is increasing. If IR is not changing, there’s no “forcing”. The effect of more GHG’s, all other things being equal, is to decrease IR. That’s where the “warming” supposedly comes from: because less energy is leaving than otherwise (no change in GHG’s). If the same amount of energy is leaving while CO2 increases, there’s no “forcing”. Or else what “forcing” exists is being balanced by something like “lapse rate feedback”. Outward IR is a combination of the reduced emission from adding CO2 and the increased emission from warming the surface. At the top on the long term it balances the incoming net solar, which is a fixed constraint, and so adding CO2 is balanced by surface warming to give the same outward IR.That is how the GHG effect works. Outward IR is a combination of the reduced emission from adding CO2 and the increased emission from warming the surface. 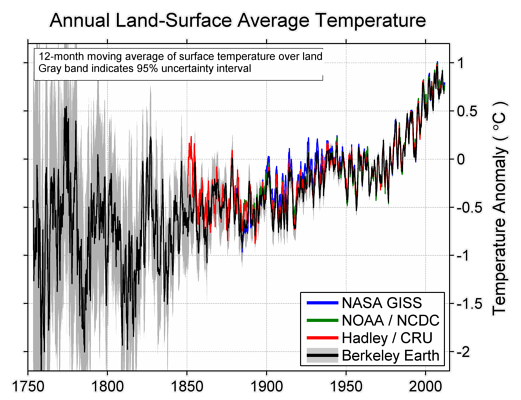 But the surface hasn’t warmed significantly in the last 15 years. Your statement is belied by the observations. This El Nino is no bigger than the 1998 one, but the background has changed a lot in 18 years. It doesn’t mean warming has stopped. On the contrary, it is balancing the CO2 increase rate. That is correct, you got something right, whatever warming CO2 tries to accomplish, earth compensates. Bill Grey said that at a Climate Conference last year. As earth warms, polar oceans thaw and snowfall increases. The upper bound of temperature is limited because it will snow more until it gets cold again. That works every time. Every warm time in the past ten thousand years has been bounded by snowfall and it always got cold after the more ice advanced. Yes, Earth compensates for CO2 increases by warming enough to offset it. Is that your entire answer? Your statement is belied by the observations. Those aren’t observations. Observations are acres of thermometer readings, etc. Those are your interpretation of observations. Even the IPCC admits there’s been a “pause”. Didn’t somebody call it a “travesty”? Who was that again? Trenberth? If you only want thermometers, you can look at land temps. The “travesty” wasn’t about the pause, it was about the lack of observations for an accurate energy budget to account for it. Was it Chinese aerosols? Was it changing ocean obs methods? These are the questions better obs would answer. Jim D’s hypothesis seems to be that if you insulate your cold cup of coffee with an insulator equivalent to the atmosphere, put it in the Sun, it will magically become 33 C hotter than an uninsulated cold cup of coffee also sitting in the Sun. That’s about as stupid as telling me that the inside of my insulated house is 33 C hotter than standing under the blazing tropical Sun. Jim D refuses to accept that the Earth was created in a molten state, or that the interior is still molten, as far as I am aware. I assume Jim D is a creationist, claiming the Earth was created recently, and that the surface has never been hotter than it is now. He completely overlooks the fact that insulators provide precisely no heat, and seems to think that putting a rock in a Thermos flask filled with CO2 will cause the rock to increase its temperature – due to the miracle of back radiation, no doubt. As to “forcings”, Warmists understand so little of physics that they have to invent nonsense terms because they are unable to use conventional definitions and physics terms correctly. But what the hell, it’s all good for a laugh. According to Jim D, the phrases “It’s CO2”, or “Its insulation”, or “Wrong!”, suffice for all eventualities. The concept of falsifiable science suits me. Yes, insulators provide no heat, but you also note that things under them stay warmer. Magical to you, perhaps. … which figures are reasonably in line with the numbers you give in your comment. Contrary to these calculations, the Moon’s surface temperature has been seen as high as 123 C, one presumes because the average albedo of the Moon says nothing about the *range*. Any dope curious enough to have stared at a full Moon on a clear night for a time can see that some areas are darker than others. Any dope curious enough to use the Internet and research surface temperature of our sole natural satellite will also note that temperatures at night on the Moon’s surface plummet to as low as 153 C. Funny what happens to surfaces in a near vacuum when they’re no longer receiving thousands of watts per unit area, innit. Also contrary to these calculations, the surface of the Earth doesn’t get anywhere near the boiling point of water at sea level. According to the Guinness book of Records: The official highest recorded temperature is now 56.7 C (134 F), which was measured on 10 July 1913 at Greenland Ranch, Death Valley, California, USA. Though I imagine some sweltering summer days in the Outback, it may feel like it’s boiling. This might also explain some of the fried brains Down Under. But I digress. Incoming solar at TOA is given as 341 W/m^2, the 79 and 23 W/m^2 bounced back into space by cloud, atmosphere and surface give an albedo of 0.30 in accordance with the NASA figures listed above. What we’ve not previously accounted for is the 78 W/m^2 absorbed by the upper atmosphere. Subtracting that out, and we do indeed get the 161 W/m^2 as advertised instead of the 239 W/m^2 we’d expect assuming a global average albedo of 0.3. Plugging 161 W/m^2 into S-B, we get 230.8 K (-42.3 C), which is a tad chilly. That’s also the global average; you’re after theoretical temperature at high noon. So, 161 W/m^2 * 4 = 644.0 W/m^2. Divide by 5.670367E-08 W m^-2 K^4, take the fourth root and we get 326.5 K (53.3 C), or 3.4 C shy of the Guinness Record in Death Valley. Moral of this story is that the Earth’s atmosphere modulates surface temperature in a number of different ways. One need only be honest and interested enough to look them up. As a “recovering extreme organic gardener” I found numerous problems with Jonathan Foley’s article. I was going to enumerate them in my comment here until I saw a Comment by Bill Price below the article with a link to a piece he wrote. He covers every one of my objections and more. After reading the two articles I’m not even sure Mr. Foley was attempting to truthfully analyze the complexity of the development of GMOs. We are going to come to the conclusion someday that it will be easier to modify just one genome (human) than to mess around with thousands of other species to solve the problems of hunger and malnutrition. Rather than double crop yields we might find it more logical to just alter human metabolism to only need 50% of the caloric intake. We will be GMO too. I think the first GMO babies were born in about 2000. With three genetic parents they caused quite a bit of controversy, with many countries outlawing various forms of human genetic engineering thereafter. I suspect voluntary population control will solve the food problem before a need to genetically reduce our metabolism becomes pressing. Eat less so we can have more children? A new car or years of dirty diapers? Population and obesity trends in the developed world have answered those questions. ,However, the days of us “normies,” is probably coming to an end. In the future who wouldn’t want to have the perfect, genetically-modified child to compete with the “Beautiful People” who will be owning the world? I’m sure the few remaining “normies'” villages will become quaint tourist attractions. The movie “Gattaca,” as well as many science fiction stories have dealt with this theme. I’ll just be glad if I don’t end up as “Soylent Gray,” in some future dystopia. Having just had my second mature, blinding cataract in eight years removed and replaced with a IOL lens that gives me excellent, no-glasses-needed vision, both near and far, I’m dubious that Nature knows best. I worship Techno, the God of An Unlimited Future. I’m 100% pro genetic engineering. Even if I wasn’t a supporter of genetic engineering I least recognize that the technology behind it is unstoppable. After reading Kevin Kelly’s book “What Technology Wants” I can pretty much see where this is all heading. Speaking of classic Sci Fi, go find a copy of Forbidden Planet (1956) if you want a really good glimpse of humanity’s future, it’s all there; Type I civilization, matter replication & cloning, Artificial Intelligence, a really visionary work of science fiction. Great to hear you are having a good experience with your IOL lens. I hope I can afford them if I need the treatment in the future. If we live on 50% of the caloric intake, we will be able to do 50% of the work, by this measure, many are already there and many others are overachievers. Why not modify crops so they don’t need sunlight? Then they could be grown in huge multi-level factories. They also could probably be crowded much closer together, since they wouldn’t be competing for light. And growing them in enclosed space(s) would eliminate most or all of the problems with insect (arthropod) pests and disease. Also natural weeds. Thus eliminating the need for poisons. And you could hike the CO2 as high as you wanted without impacting the rest of the planet. Technology is going to replace high intensity labor with automation and robotics. You can’t stop it. Did you notice how the Dallas police used a robot to take out that gunman the other day? That was some pretty cool technology! Why modify hundreds of species when it’s more efficient to just modify one genome (human). “Soylent Green” would be a lot easier to manufacture and it comes in any flavor you want. Why not modify crops so they don’t need sunlight? Crops are already grown in artificial light. That does not require a modification. It still requires energy and the best source of energy is still the energy from fossil fuels. Technology is going to replace high intensity labor with automation and robotics. I just visited a friend in the hospital, his nurse was really good. I can’t see him being as well taken care of by a robot. Robots can help, but the nurse does more of what they are most needed for. The lawn service came to out neighbors yard while I was reading this blog. I can’t see a robot dealing with what the lawn service people can deal with. Technology is going to rightfully replace much high intensity labor with automation and robotics, but there are things that a human brain can figure out. The artificial intelligence in automation and robotics is still way behind human intelligence. They solve one problem, like playing chess, but that robot cannot fix a water leak in a city water main. it was not a robot that fixed the problem with the Hubble. Some tried to come up with an unmanned fix, but did not get close. The robot killed the bad guy, but he was deployed by and controlled by people, and people cleaned up the mess after. It was not robots that dealt with all the trauma after the shootings. Technology is going to replace high intensity labor with automation and robotics and free up people to do other stuff that needs to be done that automation and robotics have not advanced enough to do. That is an evolution that will most likely always be true. Technology is going to replace high intensity labor with automation and robotics and free up people to do other stuff that needs to be done that automation and robotics have not advanced enough to do. Agreed. The dystopian future imagined by the sci-fi fans and techno-triumphalists is highly unrealistic. Their brand of nihiist Prometheanism can be traced back to the surrealist, futurist, Cosmist and Blacksmith groups that informed Bolshevism. Now this is the sort of desperate clutching at straws we find when a paradigm is ready to collapse. The sun was also probably 4% weaker at that time according to the astrophysicists, but this paper doesn’t look at that. That 4% effect is worth several CO2 doublings, and also adequately solves that problem. You keep repeating that really dumb comment. The sun was even cooler in the Cambrian and it was hotter and for much longer than in the Ordovician ice age. I agree with AK on this point. The Cambrian had a lot of CO2 at times too, but you would probably not like that as an explanation. You don’t have an explanation. You are just making irrelevant, stupid comments, as usual. I gave you an explanation, CO2. Still no falsiable hypothesis about the supposed planet heating abilities of CO2. Surely it can’t be beyond the collective abilities of the 97% of scientists who agree that the CO2 planet heating hypothesis exists, to provide a copy of the hypothesis? Or has it been hidden away by Big Oil, or the devious skeptics? Or are you just making stuff up? You’ve got nothing, Jim D, which is just as well, because nothing satisfies most Warmists. Like I said several times now, since you don’t even understand how insulation works, you won’t get very far with understanding how CO2 keeps the earth’s surface warm. One step at a time. Still no falsifiable hypothesis to suggest how CO2 heats the planet. Your hypothesis needs to account for four and a half billion years of cooling. Maybe a magic insulator, which takes four and a half billion years before it starts working. I know, I know, I don’t appreciate the magical delayed action super secret Warming properties of CO2. You’re right. I prefer normal physics. The Warmist variety doesn’t seem to work in the presence of unbelievers. You have yet to prove you even know how insulation works. Why should I bother until you do? You don’t have to bother at all. It’s no bother at all not to produce something that doesn’t exist, is it? Keep on with your belief. It’s easier than thinking, which is why most Warmists simply believe, rather than thinking. Simple beliefs, for simple people. You have yet to prove you know anything about physics. Not even a building block to start with. Your only building blocks probably have letters on them. I’m not sure why I should have to prove anything to you. Have you any particular reason to imagine that I care what you think? Or do you just have random imaginings of bending strangers to your will? And still no falsifiable CO2 planet heating hypothesis. As one might expect from a Wayward Woebegone Waffling Warmist. Trying to figure out what you know so far. Not much from what I see. Try the starters guide in the WSJ ads. More demands from the ignorant to sink to their level of ignorance. Thanks, but no thanks. I’ll leave you to enjoy yourself. You deserve it. We are not even going to get your molten earth theory to entertain us? Oh, well. There’s no good paleo correlation. And “but CO2” doesn’t fly for the “snowball earth” episodes of the Neoproterozoic Era. Assuming that’s what happened. Spare us the “CO2 lags not leads” Zombie. And “but CO2” doesn’t fly for the “snowball earth” episodes of the Neoproterozoic Era. Then perhaps you ought lay off the But Cryogenian arguments in a vain attempt to dismiss what has been known to modern physics for on the order of a century. 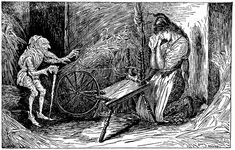 [Hertz and Maxwell] had done their work without thought of use and that throughout the whole history of science most of the really great discoveries which had ultimately proved to be beneficial to mankind had been made by men and women who were driven not by the desire to be useful but merely the desire to satisfy their curiosity. Unfortunately, science seems to have changed from the personal satisfaction of curiosity, to an opportunity for secure employment, the possibility of awards, honours, public acclaim and so on. There is nothing wrong with this, except that science, under these circumstances, becomes a thinly veiled funds fight. I remain optimistic that individuals will continue to think that which has never been thought before, and that serendipity and luck will continue to play their part. There are many questions, and even more people prepared to supply facile answers – usually involving more funding. Just look at “climate science” – supposedly settled science that becomes seriously unsettled at the prospect of funding being reduced, or the thought that the continued worship and adulation of climate scientists may not be vitally necessary to the progress of society generally. All part of the rich tapestry of life. They’ll have little idea of when or for how long, while they assume the variability to be internal an random, though it is good to see the wide range of natural variability acknowledged. “They couldn’t find any signal of the forcing to explain these changes to date,” said Dr Pablo Ortega from the University of Reading, who wasn’t involved with the study. One of the great problems of climate science is ascribing fantastic accuracy to figures and data that is by no means certain. Land Temperatures have been generally rising for some 300 years following the severest period of cold climate this side of the Holocene. This follows a warm period that lasted several hundred years. I have had a conversation many timeS with John Kennedy at the met office regarding global sst’s to 1850 . I believe it is absurd to believe we have a global figure or, bearing in mind how they were compiled, that they have enough accuracy to warrant being an international standard that others use to make decisions. In essence: it’s ridiculous to think we have enough instrumental data from the mid 19th Century to figure out what’s going on with the planet, but (some unspecified) proxy data from the deep Holocene are adequate enough to put the the MWP and LIA into context with the unreliable modern instrumental record. The … rules … for when data are good enough and when they’re not is mind-boggling. Except not really: good data are those which tell one that which one wants to believe. Unspecified? 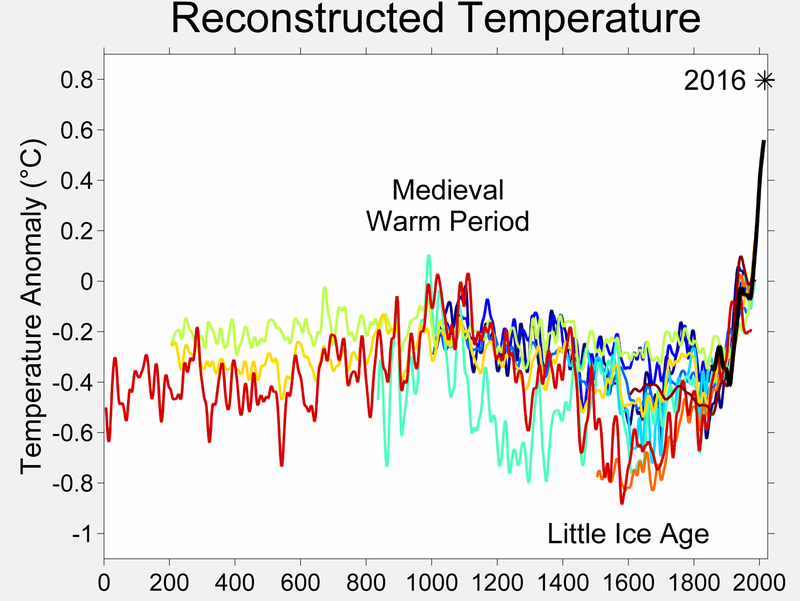 I have written a dozen articles citing information which ranges from instrumental temperatures to 1659, actual accounts of climate from contemporary records, glacial records, manorial and crop records, wine records, archaeological remains, migration of tree lines etc etc. We can follow the rise and fall of temperaturs, of glaciers, of sea levels to know the general tendency. The modern warming trend commenced centuries ago, meaning giss etc is a staging post and not the starting post of temperature rises. Have you an opinion as to when the modern temperature rise commenced? I can’t read (or remember) the whole Internet, TonyB. The modern warming trend commenced centuries ago, meaning giss etc is a staging post and not the starting post of temperature rises. That would be a real show-stopper if I were of the mind that CO2 alone controlled every wiggle in any given temperature reconstruction. Red line: rescaled IPCC 1990 Figure 7.1(c), based on Lamb 1965 showing central England temperatures; compared to central England temperatures to 2007, as shown in Jones et al. 2009 (green dashed line). Also shown, Mann, Bradley & Hughes 1998 40 year average used in IPCC TAR 2001 (blue), and Moberg et al. 2005 low frequency signal (black). “If you look at the energy balance of the whole Earth, if you increase CO2 it has to get warmer,” said co-author Prof Danny McCarroll also from Swansea University. “We may have rising temperatures in a predictable way, but every now and again the climate systems in this part of the world can roll the sixes on a dice, of very cold wet summers or very warm dry summers,” said Dr Gagen. … not least because dice are deterministic. If only we could throw them exactly the same way every time in a vacuum onto a surface that isn’t changed by their impact … we’d all be rich! … though it is good to see the wide range of natural variability acknowledged. Owing to natural variability, trends based on short records are very sensitive to the beginning and end dates and do not in general reflect long-term climate trends. Also, because it extends back in time farther than any other global instrumental series, GMST is key to understanding both the causes of change and the patterns, role and magnitude of natural variability (Chapter 10). Holland, G. J., and P. J. Webster, 2007: Heightened tropical cyclone activity in the North Atlantic: Natural variability or climate trend? Philos. Trans. R. Soc. London Ser. A, 365, 2695–2716. Trenberth, K. E., and D. J. Shea, 2006: Atlantic hurricanes and natural variability in 2005. Geophys. Res. Lett., 33, L12704. CMIP5 models generally exhibit realistic variability in GMST on decadal to multi-decadal time scales (Jones et al., 2013; Knutson et al., 2013; Section 9.5.3.1, Figure 9.33), although it is difficult to evaluate internal variability on multi-decadal time scales in observations given the shortness of the observational record and the presence of external forcing. 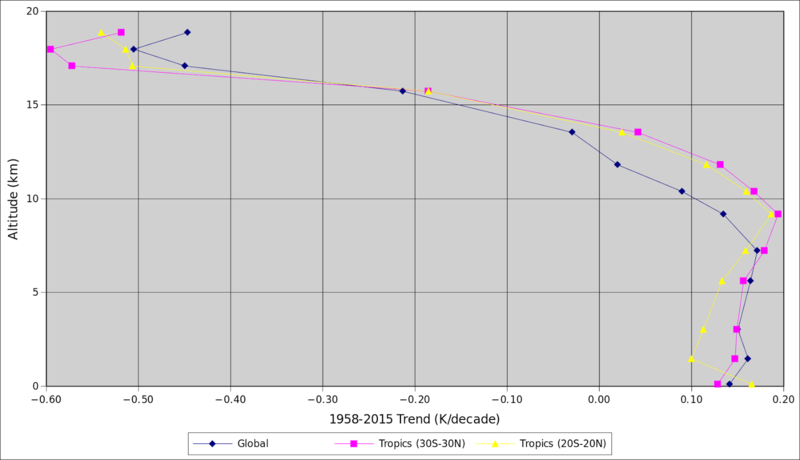 The observed trend in GMST since the 1950s is very large compared to model estimates of internal variability (Stott et al., 2010; Drost et al., 2012; Drost and Karoly, 2012). Knutson et al. (2013) compare observed trends in GMST with a combination of simulated internal variability and the response to natural forcings and find that the observed trend would still be detected for trends over this period even if the magnitude of the simulated natural variability (i.e., the standard deviation of trends) were tripled. Factors other than observational uncertainties that contribute to inconsistencies between observed and simulated free troposphere warming include specific manifestation of natural variability in the observed coupled atmosphere–ocean system, forcing errors incorporated in the historical simulations and model response errors (Santer et al., 2013). The Earth’s climate is always changing, and that can occur for many reasons. To determine the principal causes of observed changes, we must first ascertain whether an observed change in climate is different from other fluctuations that occur without any forcing at all. Climate variability without forcing—called internal variability—is the consequence of processes within the climate system. Large-scale oceanic variability, such as El Niño-Southern Oscillation (ENSO) fluctuations in the Pacific Ocean, is the dominant source of internal climate variability on decadal to centennial time scales. Climate change can also result from natural forcings external to the climate system, such as volcanic eruptions, or changes in the brightness of the sun. Forcings such as these are responsible for the huge changes in climate that are clearly documented in the geological record. Human-caused forcings include greenhouse gas emissions or atmospheric particulate pollution. Any of these forcings, natural or human caused, could affect internal variability as well as causing a change in average climate. Attribution studies attempt to determine the causes of a detected change in observed climate. Over the past century we know that global average temperature has increased, so if the observed change is forced then the principal forcing must be one that causes warming, not cooling. The causes as to why models underestimate the observed poleward expansion of the tropical belt are not fully understood. Potential factors are lack of understanding of the magnitude of natural variability as well as changes in observing systems that also affect reanalysis products (Thorne and Vose, 2010; Lucas et al., 2012; Box 2.3). The causes of recently observed Antarctic ice sheet contribution to sea level are less clear due to the short observational record and incomplete understanding of natural variability. Detection of human influences on sea level at the regional scale (that is smaller than sub-ocean basin scales) is currently limited by the relatively small anthropogenic contributions compared to natural variability (Meyssignac et al., 2012) and the need for more sophisticated approaches than currently available. Low-frequency tropical ocean temperature anomalies in all ocean basins appear to force circulation changes that promote regional drought (Hoerling and Kumar, 2003; Seager et al., 2005; Dai, 2011). Uniform increases in SST are not particularly effective in this regard (Schubert et al., 2009; Hoerling et al., 2012). Therefore, the reliable separation of natural variability and forced climate change will require simulations that accurately reproduce changes in largescale SST gradients at all time scales. Some recent studies suggest that the reduction in the aerosol forcing (both anthropogenic and natural) over the Atlantic since the 1970s may have contributed to the increase in tropical cyclone activity in the region (see Section 14.6.1 for details), and similarly that aerosols may have acted to reduce tropical cyclone activity in the Atlantic in earlier years when aerosol forcing was increasing (Villarini and Vecchi, 2013). However, there are different views on the relative contribution of aerosols and decadal natural variability of the climate system to the observed changes in Atlantic tropical cyclone activity among these studies. If an event occurs in the tail of the distribution, then a small shift in the distribution as a whole can result in a large increase in the probability of an event of a given magnitude: hence it is possible for the same event to be both ‘mostly natural’ in terms of attributable magnitude (if the shift in the distribution due to human influence is small compared to the anomaly in the natural variability that was the primary cause) and ‘mostly anthropogenic’ in terms of attributable risk (if human influence has increased its probability of occurrence by more than a factor of 2). These issues are discussed further using the example of the 2010 Russian heat wave below. The science of event attribution is still confined to case studies, often using a single model, and typically focussing on high-impact events for which the issue of human influence has already arisen. 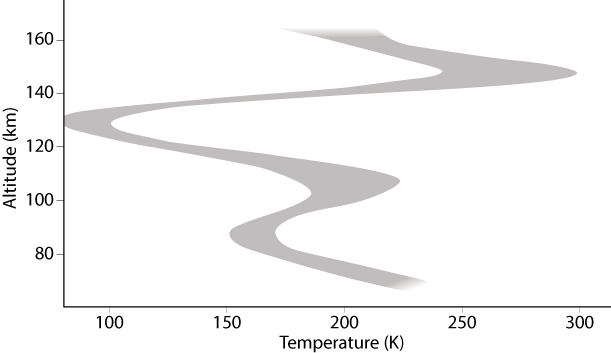 While the increasing risk of heat waves measured as the occurrence of a previous temperature record being exceeded can simply be explained by natural variability superimposed by globally increasing temperature, conclusions for holistic events including general circulation patterns are specific to the events that have been considered so far and rely on the representation of relevant processes in the model. Anthropogenic warming remains a relatively small contributor to the overall magnitude of any individual short-term event because its magnitude is small relative to natural random weather variability on short time scales (Dole et al., 2011; Hoerling et al., 2013). Because of this random variability, weather events continue to occur that have been made less likely by human influence on climate, such as extreme winter cold events (Massey et al., 2012), or whose probability of occurrence has not been significantly affected either way. Some analyses used in AR4 were based on the well observed forcing and responses to major volcanic eruptions during the 20th century. The constraint is fairly weak because the peak response to short-term volcanic forcing depends nonlinearly on ECS (Wigley et al., 2005; Boer et al., 2007). Recently, Bender et al. (2010) re-evaluated the constraint and found a close relationship in 9 out of 10 AR4 models between the shortwave TOA imbalance, the simulated response to the eruption of Mt Pinatubo and the ECS. Applying the constraint from observations suggests a range of ECS of 1.7°C to 4.1°C. This range for ECS is subject to observational uncertainty and uncertainty due to internal climate variability, and is derived from a limited sample of models. Schwartz (2007) tried to relate the ECS to the strength of natural variability using the fluctuation dissipation theorem but studies suggest that the observations are too short to support a well constrained and reliable estimate and would yield an underestimate of sensitivity (Kirk-Davidoff, 2009); and that assuming single time scales is too simplistic for the climate system (Knutti and Hegerl, 2008) . Thus, credible estimates of ECS from the response to natural and internal variability do not disagree with other estimates, but at present cannot provide more reliable estimates of ECS. Variables other than land surface temperature, including some oceanic regions, also show rates of long-term change different from natural variability. For example, Arctic sea ice extent is declining very rapidly, and already shows a human influence. On the other hand, local precipitation trends are very hard to detect because at most locations the variability in precipitation is quite large. The probability of record-setting warm summer temperatures has increased throughout much of the Northern Hemisphere . High temperatures presently considered extreme are projected to become closer to the norm over the coming decades. The probabilities of other extreme events, including some cold spells, have lessened. In the present climate, individual extreme weather events cannot be unambiguously ascribed to climate change, since such events could have happened in an unchanged climate. However the probability of occurrence of such events could have changed significantly at a particular location. Human-induced increases in greenhouse gases are estimated to have contributed substantially to the probability of some heatwaves. Similarly, climate model studies suggest that increased greenhouse gases have contributed to the observed intensification of heavy precipitation events found over parts of the Northern Hemisphere. However, the probability of many other extreme weather events may not have changed substantially. Therefore, it is incorrect to ascribe every new weather record to climate change. I’ll end this overkill here since the bolded bits simply cannot be emphasized enough. Now if only Teh Paws aficionados would remember their devotion to natural/internal variability when attempting to “falsify” the concept of centennial-scale secular climate change due to rising atmospheric CO2 levels, I’d be a happy lad. ENSO is a negative feedback to indirect solar forcing variability. The AMO is the larger source of inter-decadal natural variability, it warms when solar is weaker, and warms the Arctic too. All because low solar increases negative North Atlantic Oscillation conditions. From that frame of reference, rising greenhouse gas forcing has done very little to attenuate the effects of declining solar since the mid 1990’s, as they should be increasing positive NAO conditions, as higher solar does. Rising CO2 should cool the Arctic as it increases positive NAO. They need to see how cold the polar regions on Venus are. From that frame of reference, rising greenhouse gas forcing has done very little to attenuate the effects of declining solar since the mid 1990’s, as they should be increasing positive NAO conditions, as higher solar does. […] Rising CO2 should cool the Arctic as it increases positive NAO. Bit too much a leap from premises to conclusions for me to swallow whole. Also does nothing to explain why so much heat has been going into the deep oceans since the 1950s, nor why most places on the surface have warmed since the mid-19th century just as Arrhenius predicted in 1896. They need to see how cold the polar regions on Venus are. Whaaaat? Surface of Venus is essentially isothermal, a function of it having the densest atmosphere of any terrestrial planet in this system. Day, night, season, latitude … it doesn’t matter. Only so much, and it hasn’t accelerated noticeably, neither has the rate of sea level rise. Venus has very strong polar vortices which trap the cold in and exclude the warmth from lower latitudes, the same that happens with Arctic when the AO/NAO are well positive. ESA spacecraft Venus polar atmosphere temperature profile, is much colder than Earth’s atmosphere at 130km, and possibly over 400°C colder than its mid latitudes at near surface. While on Saturn the difference between the polar regions and the mid latitudes are only around 10°C, because of profound poleward heat transports. Even without lag, the fit to CO2 is very good. Even if the physical mechanism weren’t well-described and long-established, the relationship would be too obvious to readily dismiss out of hand. With an average depth of some 3500 meters there is a awful lot of ocean unmeasured and despite the best efforts of Purkiss, likely to remain so for decades. We had no way of accurately measuring global OHC even down to 2000m until Argos as Eli confirmed here just a few days ago. Could you extend that chart back to 1100 AD to see if there was a similar acceleration during the so-called MWP? You cannot claim any scientific result of significance with such a mishmash of reasoning. Is it accelerating (ever so slightly) or is it oscillating (ever so slightly) around a straight line? And how long must the record be to make either determination with reasonable confidence? Anything…. give anything but ACO2. LMAO. Foolish Warmists convince themselves the Earth was created cold, or at least very recently, and has warmed since. Obviously Creationists one and all. If the surface was ever molten – it has cooled to date. If the seas were ever boiling – they have cooled to date. Foolish Warmists cannot even provide a falsifiable hypothesis to account for this. Non science, rather than real science. Then how is it Ulric knows ocean heat uptake isn’t increasing, climatereason? Sure, if you accept captdallas’ stumpingfor Rosenthal et al. (2013). Read upthread a bit for me pulling a Trenberthian lament at the travesty that I don’t have XBT/MBT data prior to 1955 to play with. Point was that *both* fits are good. I’m not going to get published doing simple linear regressions, but it takes some pretty hefty mental gymnastics to miss the glaringly obvious relationship using only one’s bare eyeballs. Still waiting for someone to come up with an observable, quantifiable mechanism which better explains temperature trends than does CO2. With all the JAQ-ing off going on in response to the awful truth, I suspect none will be forthcoming any time soon. Why is it increasing at all was the original question. No goalpost too big to move or squirrel to small to chase, innit. Generations from now, these guys’ grandkids could be standing neck deep in sea water where downtown Miami used to be saying it’s all within the realm of precedented Natural Variability. Look at the Eemian! Wait … how do we know that interglacial was hotter than the Holocene? In the context of a long-running conversation teh Rabett has been having with Senior over whether the longer term surface temperature record is better than the shorter-term vertically-averaged ocean temperature record. Combined, both make a stronger case for warming over the 1955-present warming than either record would alone. Tack on to that the data from radiosondes, orbiting microwave sounding units, landed ice melt and rising sea levels. All point to the same thing, complimenting and reinforcing each other. Against all reason, you guys handwave it away as if it were all just some unlikely coincidence of chaotic variability. Let’s not forget we know a lot about the radiative properties of CO2 and other so-called greenhouse gasses from controlled laboratory experiment, nor that radiative theory which was put there by the likes of Planck — and which is used daily in practical engineering applications — grounds observations which were predicted by Arrhenius in the late 19th Century. Not that I consider him an ultimate authority all by his lonesome, Eli is also big on consilience of evidence, along with consistency and consensus (of domain experts) … the Three Cs of Science as he puts it. Or Three Seas if you’ll pardon a horrible pun. One of the great problems of climate science is ascribing fantastic accuracy to figures and data that is by no means certain. I have had a conversation many timeS with John Kennedy at the met office regarding global sst’s to 1850 . I believe it is absurd to believe we have a global figure or, bearing in mind how they were compiled, that they have enough accuracy to warrant being an international standard that others use to make decisions. Our knowledge of the global deeper ocean down to 2000 m is at best restricted to a few decades or with Argo, just the last decade. As for the deeper ocean, we do not have the technology to measure it. The words of Thomas stocker at the Exeter climate conference that I attended a year or so ago. So it seems likely that ocean temperatures have been generally rising since 1800 or so, gordon Manley of the met office reckoned glaciers started retreating again around 1750 which fits in with the dates that lamb calculated. 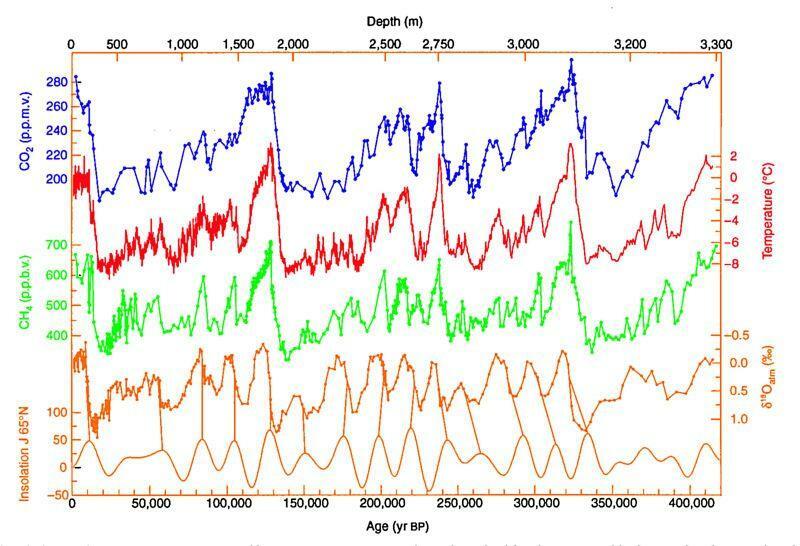 It seems likely that prior to that ocean temperatures had dropped and prior to that ocean temperatures had risen. This is validated By the apparent sea level high level stands at around 1200 ad and 1600ad and we are currently reaching the levels attained during the roman warm period. Ine between rising co2 and ocean heat content. I think TonyB is correct. Further more for the general investigation into the temperature decadal oscillations, it makes very little or no difference weather data is presented with one decimal point or integer precision. In this graph blue line is the CET using monthly data from the Met Office. 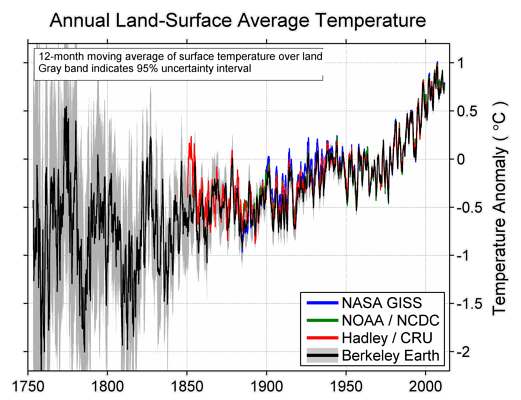 The red line is constructed in similar manner, but only after each months temperature is first rounded off to the nearest integer, while the green line (the right hand scale) is the error introduced by rounding off the monthly data. As far as I can ascertain, for estimating the effect from any of the major factors (solar activity, AMO, CO2 etc ) makes very little practical difference, whether the CET data is presented with one decimal point or the integer precision. 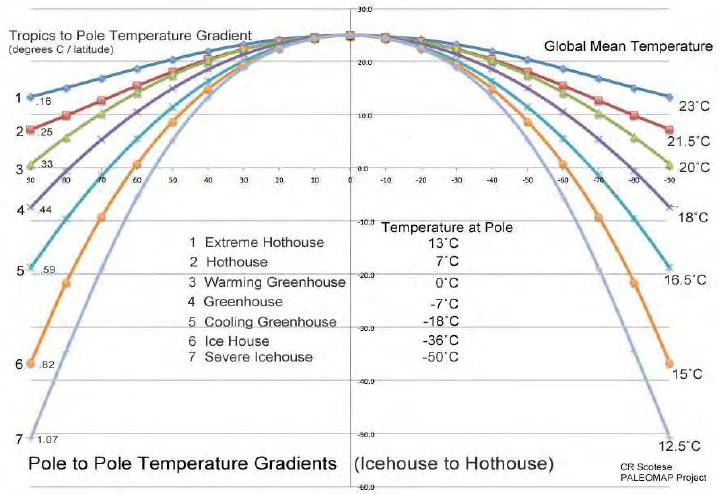 I see no purpose in expanding the exercise to the temperature data sets given with two decimal point precision. I think TonyB is correct. Only if TonyB thinks integer precision of a single instrument is “fantastic.” I will say that your plot is a fantastic illustration of how multiple, relatively imprecise, observations obtain remarkably similar results to data individually an order of magnitude more precise. Let the record show climate scientists didn’t invent that formula. 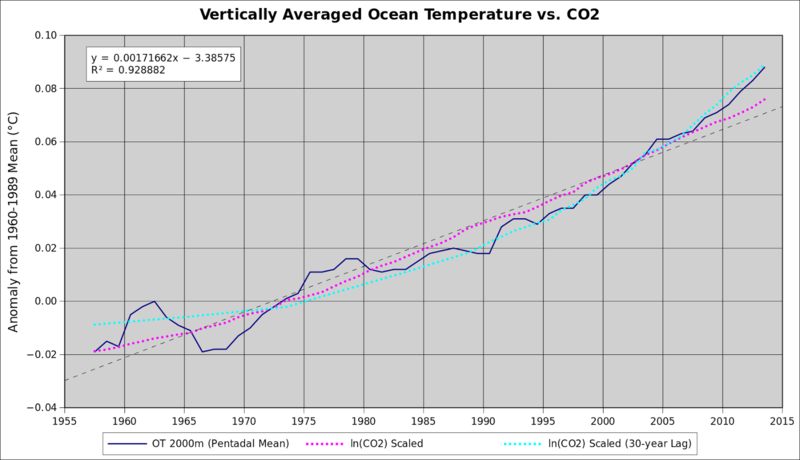 I was remarking on the rate of acceleration, which had become marginally steeper from the mid 1990’s, by a couple of hundredths of a degree, which is interesting as a warmer AMO reduces CO2 uptake. [sigh] This subthread began with you asserting that OHC wasn’t accelerating noticeably. I would actually expect a postive AMO to reduce the rate of ocean heat uptake, and for that to be dominant over a reduction in CO2 uptake. It looks like I may be correct. Most of us can’t afford this nor can billions of people I imagine. It makes less sense the closer one gets to the poles. But does give him independence from energy grid problems. It’s individualistic assuming no use of subsidies. It might be hard to reconcile with a, We are all in this together worldview. If it’s not happening on a large scale, he’ll just do it himself. Or maybe not. Good luck to him. I think he might need some. Upside down weather patterns. Cool Summers and warm Springs and Falls? Cold in the South, warm in the North? Average West to East track of weather reversing? I am rolling my eyes. Does ‘recent years’ mean 4 of the last 5? I ask you, what the heck have been the long term effects of Circumference Change, on the Earth’s weather and CO2 levels? We are going to be bumping into the Moon, in about 28,000,000,000 years or so? A big hose clamp perhaps will be able to do the trick. I was just sittin here thinking… since this CC thing, has been going on consistently for the last 4,500,000,000 million years… the only thing I can come up to explain it is that the Earth’s core is getting hotter. How does that work? You don’t thing the CC is reality? You think been this size? Get real. Sorry about the sloppy writting. The size of the planet Earth, must have increased in circumference as shown by continental drift. Maybe you’ve noticed, the IPCC appears to be focused on 2100, and somewhat on paleo. Once in awhile there will be a venture beyond 2100, but not often. You work on the way out. Good use of your time. Monsanto should start a climate blog. It’s not quite a blog, but it’s something. So failure to co-operate with unelected lobby-ridden technocracies is anti-democratic. Got that already, guys. We’ve been given countless stern lectures over Brexit. We’ll never try freedom again, promise. From now on it’ll be ein folk, ein reich, lots of lobbies. I believe the Governments of Iraq, Afghanistan and Somalia (to start with), would serve as places for the first social progress panel to start. These Governments would no doubt welcome being told what to do by such a panel of experts. I wish the panel all the best. Dan can usually get us thinking right after our brief outbursts and little flirts with skepticism. You can make more good zombie warmists by effective science communication than by the lash, I always say. Persuasive communication aimed at largely disenfranchised masses became central to Lippmann’s strategy for domestic governent and international relations. He saw mass communication as a…necessary instrument for any managing elite. The social sciences offered tools that could make administration of what would otherwise be highly unstable social structures relatively rational and effective, he contended. Laswell extended the idea, giving it a Machiavellian twist. He emphasized employing persuasive media and selectively using assassinations, violence, and other coercion [e.g., economic enducements such as jobs and promotion for right thinking and job loss and demotion for wrong thinking] as a means of “communicating” with and managing disenfranchised people. He advocated what he regarded as “scientific” application of persuasion and precise violence…. “Propaganda [has attained] eminence as the one means of mass mobilization which is cheaper than violence, bribery and other possible control techniques,” he wrote in 1933, adding that “successful social and political management often depends on proper coordinaiton of propaganda and coercion. From Glory Road by Robert Heinlein. But then I grew up on Robert Heinlein. When I consider events such as the California MegaFlood and the Dust Bowl I conclude that natural variability is much more deadly and problematic that carbon dioxide. All the unsubstantiated hand waving about superstitious indirect causation from CO2 is meaningless when nature can and will kill more humans regardless of CO2 content. High sensitivity of meltwater runoff volume to surface air temperature amplitude is revealed. The SciAm article on the 1861-2 California floods was amazingly free of the usual contortions and activist messaging. Whew. How did that get through? Well, glad it did. Worth remembering that the California mega-floods occurred DURING the great Civil War DROUGHT. Australia’s deadliest flood, in 1852, occurred in the year following its (and the world’s) greatest known wildfire. Which is why one should plan for everything, not just the alarms of fashion. “democratic societies must organize themselves to use what science knows about how ordinary members of the public come to recognize what is known to science”. An interesting idea, and I think it is a good one, but I feel that the author has got the emphasis a bit backwards. Fact is that whenever there is a persistent controversy then some scientist(s) are doing bad science and it would be more productive to turn a proper unbiased scientific spotlight on the scientists and their science than it would be to investigate how members of the public perceive it. Lets face it, investigating public perception is already being done in the field of climate science, and the whole process has already been corrupted by those who think that they can change the public’s mind by better communication without first checking the validity of what is being communicated. They should check the science carefully before they check the public. And these guys are pretty persistent, but figure it out in the end. I suppose that’s because the beetle has a goal in mind. This Kahan paper already featured in Judith’s Week in Review of 18th June, via a link to Kahan’s cultural cognition blog. Some comments there, and here too from last time around. The Antarctic had a record minimum ice shelf and sea ice phase a few years ago. That is when more snow falls on the land and rebuilds the ice on the land. After the more snowfall on land, the ice flow increases and increases the ice shelves and makes the ocean colder and increases the sea ice. This natural cycle puts more ice on land when the ice donuts around Antarctic are small and then ice donuts grow and it gets colder. This natural cycle puts less ice on land when the ice donuts around Antarctic are large and the ice depletes, the ice flow decreases and the ice donuts shrink and it gets warmer. It is a simple natural cycle. Occam’s Razor cuts through the muck. In the northern hemisphere, the same cycle works with Greenland and the Glaciers and ice fields in high mountains. The cycles work independent and sometimes the NH and SH are in phase and sometimes out of phase. Inspect the ice core data for both hemispheres. Both hemispheres alternate between warmer and colder as the ice extent retreats and expands. The Climate scientists acknowledge this correlation between ice extent and temperature but they say the temperature change as a result of other stuff drives the ice cycle. There is no other stuff that always correlates. These ice cycles are really a result of increases snowfall on land when polar oceans are thawed and decreased snowfall on land when polar oceans are frozen. Again, Occam’s Razor cuts through the muck. The paper’s explanation is circular. It says rock weathering sucked out the CO2 in the atmosphere thus causing the ice age. But the problem was how could there be an ice age when CO2 was 8x higher than today. The paper simply said the CO2 was low so the ice age. Possibly a GRB caused the extinction, but probably not the ice age. That was tectonics. Gondwanaland moved to the south pole. Ice built up compounding albedo, sea level dropped. Estimated CO2 at the time 4400ppm, down from 8000ppm at Ordovician onset, per two sets of geology sources (but dunno how estimated). So much for CO2 control knob. RE: Has Physics Gotten Something Really Important Really Wrong? Isn’t there evidence for a multi-verse, either in time or in some higher level space? The chances the universal constants are the right ones to support life are pretty small. One physicist described the chances as one grain of sand in all the grains of sands in the world. Some might argue you must either have multi-verses or you must have God, or we got really, really lucky. Seems like a safe bet our universe is the right one of many that supports life. The point I thought the article was making is “What difference does it make?” You might as well think about the supernatural, at least at this point. These universes, should they exist, do not affect us, and ours does not affect them. So how do you test the theory? I’m willing to accept God as the answer ahead of multiverse. Not that I am sure there is no multiverse. I list it under interesting hypothesis’. Ignorance is what invokes us to postulate God or multiverse. That’s hardly science. If scientists don’t know the answer, they say we don’t know. They don’t make up things that are unobservable, non-falsifiable, unphysical and supernatural. That’s theology and metaphysics. If we know everything, there’s no need for science. The whole business of science is searching for physical theories that explain what we currently don’t understand. Not knowing the answer is no excuse for abandoning science in favor of theology. Or we would still be doing the rain dance instead of studying meteorology. By the way, string theory is a misnomer. It is not a theory at all. It is a set of ideas and aspirations that such a theory will one day be discovered. It is not true that the math of string theory is too difficult to solve. Nobody has a clue on what equation to solve. You write this as if ignorance is a pejorative, or positing theories that aren’t currently provable is a pejorative. It seems to me ignorance, and understanding one is ignorant, is the first step in a lot of scientific discovery, as is creating theories to explain phenomenon. A lot of progress was made with heredity before the underlying mechanism was discovered, for instance. Hence, none of it was “provable,” or better “falsifiable.” In fact, nothing ever is strictly provable or falsifiable anyway. You took a quantum leap there. Ignorant and knowing one is ignorant is a quantum leap. Those who invoke unphysical things think they know the answer – unphysical things. Those who pursue science know they are ignorant. Scientific theories are falsifiable. If an apple falls upward, gravity would be falsified. If a bird’s egg hatched and a human baby came out, evolution would be falsified. So far none of these have been observed so we trust the law of gravity and evolution are valid. It’s not a quantum leap from “ignorant” to “aware one is ignorant.” “aware one is ignorant” is a subset of ignorant. Nor do I think it is a “quantum leap” from someone who is not aware they are ignorant to realizing they are ignorant. Except for some way too smart people. In fact, all science is merely a model for the actuality. I’m going to sign off here. Looks like our disagreement is much deeper than I thought. While it is true that we cannot confirm ‘reality’ outside the physical universe, order, patterns, time and such, are nothing more than human perceptions. That is, of course, unless it actually does turn out that we are special. If gravity and time are nothing more than human perceptions, then the universe did not exist until some hairless apes in a tiny planet from one of the hundred billion stars of one of the hundred billion galaxies evolved intelligence. How the climate responded and may respond going forward. Mainstream climate research is clueless. All of the global warming can be shown to be linked to natural climate oscillations and factors that control the climate. Those ranging from high solar activity until 2005 and the associated effects which would result in warming, lack of major volcanic activity , a mostly positive AO,NAO Index, PDO /AMO warm mode for most part featuring more EL NINO versus LA NINA activity. This has started to change post 2005 and now with the maximum of Solar Cycle 24 ending, the recent strong EL NINO gone, cooling not warming going forward will be the rule. I also suspect Sea Surface Temperatures on a global basis(in response to very weak sustained solar activity moving forward)will be cooling, Global Cloud Coverage will be on the increase along with greater Sea Ice/Snow Coverage, and a more meridional atmospheric circulation. Increased Volcanic Activity (major)is more likely then not since we have not had any volcanic activity with an explosive index of 5 or higher since 1992 will be another factor in contributing to cooling going forward. Just a 1% increase in albedo would wipe out all of the global warming that has happened post 1840. I think if solar remains very low from now – 2020 that at the very least all of the global warming that had taken place post 1840 will be gone. One thing that will have escaped the august inhabitants of this blog is that I have just graduated, at the relatively young age of 65, with a BSc (Hon) degree from the Open University specialising in Renewable Energy & Environmental Management. Sorry for butting in, just feeling a tad proud. Congratulations! It takes real application and dedication to finish a course at the Open University. I haven’t given up on going back to get a PhD. 4 degrees is a nice even number and would match that of my uncle Bill. What does the Open University specialising in Renewable Energy & Environmental Management teach about CO2 and dangerous warming and sea level rise? Such delusion really makes me speechless. If only Lenin or Goebbels had such knowledge at their disposal we probably wouldn’t have to discuss things on blogs like this one. Did anyone forget that “Socialism is so successful because it is so scientific”. Seems there isn’t something as dangerous as a social scientist having an idea. The problem is called the “Dunning-Kruger Effekt” and has no solution. During the Ordovician period, the concentration of carbon dioxide in Earth’s atmosphere was about eight times higher than today. It has been hard to explain why the climate cooled and why the Ordovician glaciations took place. A new study shows that the weathering of rock caused by early non-vascular plants had the potential to cause such a global cooling effect. Possible explanation: The movement of our planet around the sun as it passes through space is not effected by the level of Earth’s atmospheric CO2, nor is the shape of Earth’s orbit around the sun, which is directly related to Earth’s absorption and reflectance of solar radiation, that in turn is directly related to global cooling. An average swing of 7°C in the global average temperature occurs over Earth’s warm and cool 100,000 cycles– e.g., 10,000 years of global warming interspersed by 90,000 of global cooling. The effects on global average temperatures during these warming and cooling phases can in turn be amplified by other naturally-occurring effects over still longer cycles, resulting in an Earthly ice ages coming in at a cool 4°C or a more tropical 35°C when ferns grow on the poles. This effect not only exists, also more domain knowledge leads to greater polarization. However, this polarization doesn’t tell you which side is right and which is wrong, only that strong culture must be present (on one or both sides). Kahan inputs a hard prior assumption that the consensus on climate calamity must be factually correct, hence deduces that the cultural influence must largely be on the side opposing this consensus. However, recruiting further social data bypasses the need to input any assumption, and allows the data to *tell us* which side the main culture is on. Although alliance effects mean there is actually cultural behavior on both sides, it turns out that the main driving force behind the polarization is a culture on the consensus side. The climate change consensus is not a scientific one, but an enforced social one based upon the cultural certainty of near-term (decades) climate calamity. Are you saying that Kahan thinks that there is a disproportionality in “cultural influence” on the different “sides,” respectively? If so, please point out where he has indicated such. In earlier stages of Kahan’s investigation, he expressed surprise at his conclusion. You may recall this as the ‘whats going on in their heads’ post. He says there: ‘ So what should we make of the highly science comprehending individual who gets a perfect score on the OCSI but who, consistent with his cultural identity, states, “There is no credible evidence that human activity is causing climate change”? ‘ He describes this surprising effect as ‘dualism’, an early version of ‘knowing disbelief’. It’s a shame his surprise didn’t lead to more questioning. However at no stage does he suggest that the mainstream position in the climate domain is a result of similar cultural identity factors. Hence, asymmetry. To preempt your traditional next question, the above does not speak to the fact that (in some countries more than others, e.g. the US) there is strong cultural behavior on both sides. This is due to cultural alliance effects (with political tribes) as noted to you at times previously. See the potted paragraph on this in footnote 6 of my last guest post here (on ‘denialism’). Your keen following of my comments suggests very positive interest, you must easily be my most prolific respondent. So I’m a little surprised at your surprise, assuming this is what ‘wow’ expresses. Surely you must be extremely familiar with my approach and conclusions by now? In fact I recall you said a while back that you’d read my work at the link above. I think on this topic we have to defer to Josh’s vast knowledge on culture and tribalism. After all isn’t there peer reviewed research showing conservatives are more authoritarian than liberals? [I]t turns out that the main driving force behind the polarization is a culture on the consensus side. The climate change consensus is not a scientific one, but an enforced social one based upon the cultural certainty of near-term (decades) climate calamity. The very notion of a “consensus” is characteristic of a cultural phenomenon, not a scientific one. “The right thinking is the base for right action…. The National Socialist revolution is a revolution of thought! Its greatness lies in the fact that it has dethroned individual thought, which governed us for centuries, and has replaced it by communal thought,” wrote the press spokesman for the Ministry of Information. Artists were forced to join official groups, and any “undesirables” were dismissed from teaching posts in the academies and artistic organizaitons. Nolde, who was actually an early member of the National Socialist party, saw his own work declared “degenerate.” Willi Baumeister and Beckmann were dismissed their positions at the Frankfurt Stadelschule. Dix, Paul Klee, and Max Pechstein were fired from the academies in Dresden, Dusseldorf, and Berlin, respectively…. Of course there were many privileges offered to those who supported the regime. At the beginning artists were exempt from military service — a privilege not granted to scientists. And many enjoyed great financial gain. To abstain spelled the end of a professional career and a life in oblivion… In 1935, two years after its founding, the Reich Culture Chamber had 100,000 members, including 15,000 architects, 14,300 painters, 2,900 sculptors, 6,000 designers and graphic artists, 2,000 art publishers and art dealers, and thousands of filmakers, actors, and musicians. This represented a formidable sellout by intellectuals. Another reason why Brexit is a good idea. It’s not good to have your technological future circumscribed by enviro-political wannabes.They should allow the UK people to vote on this topic sometime. First time in two decades I haven’t been watching the Tour. May have to catch replay tonight to watch Froome’s ride. Ordinary cues that a scientist’s claims are valid include whether his personal behavior reflects those claims and whether personal issues may reflect serious self-interest in them becoming widespread. So Mann gets rich and so does his university. Politically elevated and feted. So maybe he can’t be trusted completely. Nonscientists Gore and DiCaprio: fame, wealth and polical influence AND large homes, much air travel. Both self-interest and not walking the talk diminish their social reliability. Suzuki, Neil Young and Bob Geldof. Add the Chinese Communist applauders like Klein and Strong and Christina Figueres. Ideology suggests self-interest. It goes on and on. Regular human understanding of the reasons other humans behave as they do is crucial to a successful life. The climate change advocates who fail to behave as they advocate or have side reasons for saying what they do are legitimate targets of scepticism. The fact that they object is, in normal human understanding, further evidence of untruthfulness: if you won’t debate your view, like Gore, we believe you are hiding something. So we discount what you say. We all can’t be scientists but we are all social animals experienced in the way of our kind. If what they say is true, they need to remember that is true also. Regular human understanding of the reasons other humans behave as they do is crucial to a successful life…. We all can’t be scientists but we are all social animals experienced in the way of our kind. 8) motivation to obey and enforce social norms so that punishment is avoided and those who disobey norms or fail to enforce them are punished. Yeah but what about religion? Most of the people on this planet claim there is a god without a shred of proof – so it’s possible to pull the wool over the eyes of the vast majority of humanity for thousands of years. I never heard of a religious leader being put out to pasture because their god allows/inflicts great misery on his believers. Might be a genetic flaw so maybe we can fix it. Can the striving for perfect form and its majestic or comedic achievement by a great artist be explained by the theory of the selfish gene? I do not know but I’d be surprised if it could. Can we find on the record, examples of selfless behavior that we recognize as truly altruistic? I’d say so, don’t know what you would say. There are some human behaviors which evlutonary theory, even if we reject Dawkins’ individual-level selection theory in favor of multi-level selection theory, struggles to explain. It sounds like you’ve fallen under the spell of the New Atheists. Learn to differentiate between faith and fact. Tell me, is the one scientist you name richer than the celebrity activists? All ideologies except one’s own, apparently. This is one of the fingerprints of global warming according to some. The above is IR returning to earth. Most of it from CO2 and methane is also significant. In a discussion of this being a fingerprint it occurred to me that water vapor would also be a very good fingerprint. Incredibly strong evidence of the expected increase in water vapor. Figure 4: Change in spectrum from 1970 to 1996 due to trace gases. ‘Brightness temperature’ indicates the equivalent blackbody temperature (Harries 2001). Water vapor is missing from the above. … check the x-axis. A 1-2% increase in water vapor could easily get lost in the noise for a difference plot showing a 325-370 ppmv change in CO2 over those wavebands. Suppose I accept Harries 2001, figure 4. At around 1700 cm-1 we should see the change in water vapor. I agree there could be other causes for a change in water vapor. Seeing both the CO2 and the water vapor effect would make the claim stronger. Humlum’s graphs show flat water vapor I think. As for losing 1-2% in the noise, the CO2 effect is seen according to some. If the water vapor effect is say twice that CO2 increase in regards to sensitivity, that is to suggest if it’s happening, it’s twice as big as the CO2 effect seen. Suppose I accept Harries 2001, figure 4. At around 1700 cm-1 we should see the change in water vapor. The upper limit of 1,400 cm-1 used in this analysis was based on the useful signal to noise ratio of IRIS; the lower limit of 710 cm-1 was based on the recommendations of the IMG Science Working Group. Way I’m reading that, their analysis was constrained at either end by one or the other of the instruments used for the observational data. They used MODTRAN3 for the modeled spectra. You could go tinker with an online implementation of MODTRAN4, which only gets you out to 1,500 cm-1, but it also goes all the way down to 100 cm-1. Seeing both the CO2 and the water vapor effect would make the claim stronger. I’d think Harries & Co. knew that, and would have provided it had they been able to find a way to do it. Here in the present, Müller et al. (2016) are lobbying for better global *inside* the atmosphere measurement. As for losing 1-2% in the noise, the CO2 effect is seen according to some. Given how strongly it absorbs between 600 and 800 cm-1, it seems rather tough to miss. I do not know, but I suspect, that detecting a change in water vapor from observational spectra is more difficult because it lacks such sharply defined spectral bands. BTW, just to be clear the 1-2% I’m referring to is the increase in specific humidity. I have not worked out how that translates into outbound LW absorbed according to MODTRAN, but it would be an interesting experiment when I’m not tired. If the water vapor effect is say twice that CO2 increase in regards to sensitivity, that is to suggest if it’s happening, it’s twice as big as the CO2 effect seen. … smeared out over nearly 3/4 of the spectrum from 100-1,500 cm-1, a good portion of that overlapping with CO2 between … call it 550 and 750 cm-1. What I’m getting at is that for water vapor, it may be models all the way down for the foreseeable future. I’d also point out that were it not for the glaringly obvious CO2 forcing, the need to know the “true” water vapor feedback value would be diminished … if not all but mooted. Thank you. You’re right. One cannot yet do the same kind of study with water vapor. Something else which (belatedly) occurs to me is that the radiosonde time series are biased toward land areas and light on over-ocean regions. This explains why RATPAC-A shows higher near-surface warming than ground-based timeseries which include SSTs like HADCRUT4 or GISTEMP. Even though my vertical profile plot doesn’t rely on absolute trends as much as relative trends by pressure level and latitude to make its point, it’s conceivable that the vertical profiles would show a stronger negative lapse rate feedback over water than land. Pity the satellites don’t have as good of vertical resolution (not to mention the issues of stitching together observations as old satellites go offline and new ones are deployed, diurnal drift, etc.) because they certainly don’t have the geographical coverage bias of the ‘sondes. PS: I wouldn’t consider an increase in water vapor an AGW “fingerprint” as a perfectly natural increase in solar output would also tend to increase specific humidity. But not for the satellite era. But the Hot Spot represents a negative feedback. As a consequence, if it appears going forward, will that reduce the surface warming? I also note that El Nino years appear to be marked by a Hot Spot. The Hot Spot cools off, because it’s hot? For the RAOB era, a warmish spot does appear … But not for the satellite era. The RATPAC-A series includes the satellite era. It would be more correct to say that the orbiting microwave sounding units simply haven’t been able to resolve it. Parlaying that into “The Hotspot Doesn’t Exist” presumes that the (A)MSUs have sufficient vertical resolution to capture it. But the Hot Spot represents a negative feedback. As a consequence, if it appears going forward, will that reduce the surface warming? A negative feedback would be expected to damp the response to a warming OR cooling perturbation. You just got done (perennially) questioning whether one exists. Regardless, your statement follows because El Ninos are a feature of anomalously warm SSTs in the equatorial Pacific. Gibberish. 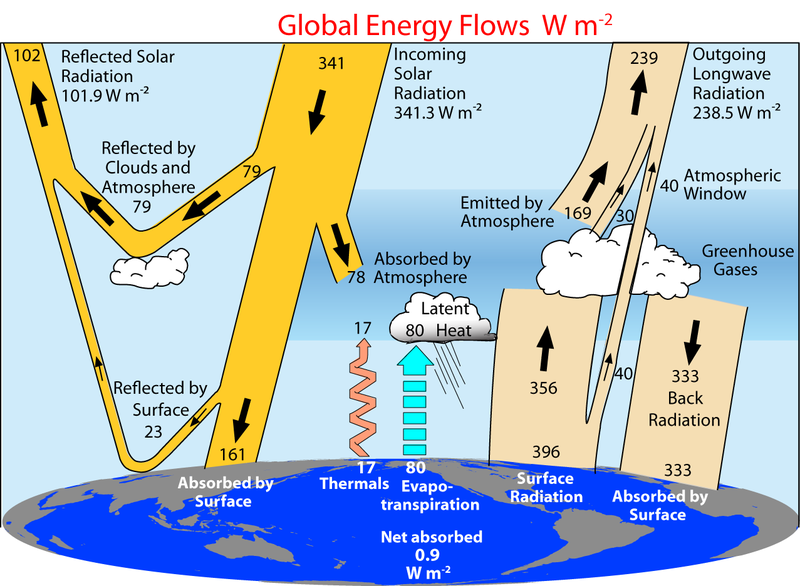 In a regime of warming, the hotspot happens because warming at the increases evaporation and convection at the surface, dumping more latent heat into the upper tropical troposphere. That’s the negative lapse rate feedback, which doesn’t mean “cools off”, it means damping of the surface warming which caused the feedback to begin with. You didn’t actually look at the data. That’s okay, nobody else does either. Trends are dynamic. Things changed between the satellite era and raob era. One of the things that changed, consistent with all of this, was ENSO. The first eighteen years of the RAOB era were dominated by La Nina. The entirety of the satellite era was dominated by El Nino. Even considering this, for the RAOB era, the trends in the Hot Spot region are weaker than modeled. The lapse rate trends for the satellite era do not indicate any change. Yep. The shape of warming matters. The presence of the Hot Spot works to remove the Hot Spot! For the satellite era, models indicate a strong negative lapse rate feedback would occur. Reality indicates no lapse feedback occurred. People can look at this many ways ( and predictably will ). The Hot Spot may or may not appear going forward, but for the satellite era, it hasn’t, and it indicates infidelity of the GCMs – for the era. The majority of the period is below the zero line. Your little fantasy is about to be turned on its head. You’re looking at ONI not MEI. ONI is based on the Nino 3.4 region only, and a poor choice for representing ENSO variation. Even considering that, the area above the red line appears to exceed the area below the blue line. Your approach has led you to very wrong conclusions. Mine has not. I’ll stick with mine. The PDO is a beast. It’s awake. It could be headed to even higher numbers. 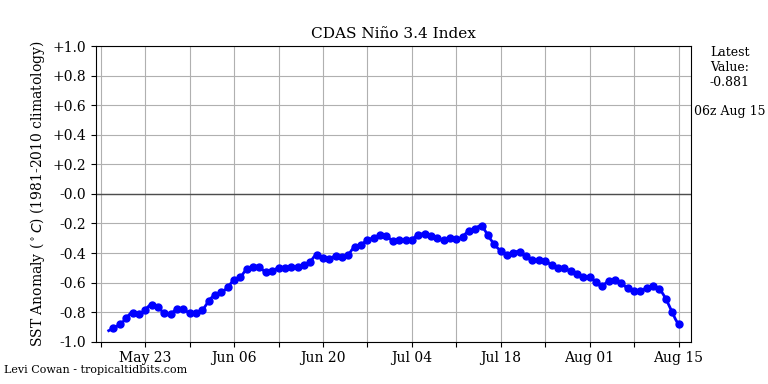 The La Nina is sputtering. Well, you do keep it topical, which is not necessarily the right perspective, but it does keep things fun. La Nina watch party? Having been directed to the bottom right corner, I did indeed miss the middle panel. Which is consistent with the fact that Teh Modulz don’t predict the exact timing of ENSO. At best they get the frequency and amplitude of ENSO broadly correct. I wouldn’t expect them to nail things like AMO — or as JCH mentions, PDO — either. In a model ensemble, internal variability gets averaged out. Thus it never occurred to me to partition the RATPAC-A data according to changes to the positive/negative integration of ENSO or other longer period indices. You’ve just given me a data project, for which I’m always thankful. Yar. Warmer things tend to radiate more than cooler ones. Warmer things closer to TOA will tend to more efficiently send it to space than warmer things closer to the surface. But doesn’t necessarily get there IF the energy lost is replaced from the surface at the same rate. Let’s keep in mind that the thing wouldn’t form to begin with if the extra energy at the surface could be dissipated out of the atmosphere without a negative lapse rate change. See above for my explanation. Your critique is typical of folk who expect Teh Modulz to be long-term weather forecasting engines. They are not, and will likely not be for the foreseeable future. If one expects them to do something they were explicitly NOT designed to do, they will of course fail expectation. Convenient, no? TE, argh, I wrote a PS to you and posted it out of sequence. As intriguing as it may sound, I suspect it’s useless to speculate upon the usefulness of useless knowledge. Unless, of course, one wishes to pursue an academic career. I have long said statistics ain’t science. More and more, even science ain’t science. This opinion piece of Dr. Foley is a folly. (Is he also a doctor of sociology?) He warns of silver bullets and reductionist thinking and then wholeheartedly employs them. His main beef against GMO is it failed to ‘feed the world’ and save the environment at the same time. Obviously Foley is unaware that he is the only who believes this is the main reason why farmers are into GMOs. He’s the one guilty of silver bullets and reductionist thinking. For all those who worry about the ability of farmers to feed the world (or a$$wipe academic elitists who think forced sterilization is justifiable), there is one simple fact to confront them with. More than half of the food produced in the world is lost to spoilage or wastage. Even in a technologically advanced nation as the US the percentage is around half. A reasonable person, knowing this, might then ponder ways of reducing spoilage and waste. An academic elitist or a hugger of trees thinks that the first action is to reduce the number of people in the world. Of course they are not of the opinion that they should be included in that reduction. The world does not have a food production problem. The article calling attention to government funds wasted on useless medical research missed the whole quack field of Climate Medicine. After all efforts to modify history, it is more likely that models reflect the adjusted data? The authors obviously need training from the likes of Steven Mosher. He’ll give you any result you want. He calls it science. Excerpt From: H. G. Wells. “The Food of the Gods. PDO and AMO appear poised to remain positive… maybe even strongly positive. AMO, PDO what difference does it make now? I’m sorry the children at your church have failed Martha Stewart’s smell test. How many times do I have to tell you mister, there is nothing new under the Sun. Human beings rapidly mining and burning vast quantities of fossil fuels is new. How many calories does it take to build a pyramid or two? A lot. Not the same. 800-700 B.C. First Chinese production of cast iron. You have no idea. Not the same. How many cast iron products were shipped to 100s of millions of consumers in North America? Zero. Get real. William Ruddiman at the University of Virginia in Charlottesville has long argued so. His “early Anthropocene” hypothesis suggests human-induced climate change may have begun 8000 years ago. Ruddiman thinks the latest study is consistent with his idea, “because people would have only turned to coal when wood became unavailable because deforestation was nearly complete”, he says. Jennifer Marlon at Yale University thinks it is unlikely that the coal combustion in China had much of a global climatic impact. “Emissions would have been way too small still,” she says. Not according to my vast knowledge. Next you will be telling the world that at that dark time in the past ages of China, they had open boarders and free trade agreements with Europe? If a person stops to think about the mouse trap that has been built by scientists with our money that has also produced a multi generational totally lethal housing project. For our next test why not let the mice run loose in a government facility eating, sleeping and drinking while doing mouse stuff wearing little radios on their ankles that will be monitored… when they are left to their own devices do you wonder if they all just die off like in the previous experiments? I do. I am very intrigued by Dan Kahan’s two suggestions. First that in most of these science/safety issues, left and right come together on the same answer, and second that on the controversial questions the experts are more divided than the general population. Do these two suggestions hold up? Let me consult a couple of Nobel Winners, Milton Friedman and Daniel Kahneman. Friedman said that most University subjects were divided into left and right schools. In biology there is nature vs. nurture and the role of genes. Why such violent disagreement over the simple physical question of how much oil is left. Let alone criminology, education, economics, and history. I think Friedman would say the full agreement areas are more the exception than the rule. Sorry, Kahan. Kahneman studied the psychology of judgment, and how we arrive at our judgments. He would agree with Kahan up to a point, agreeing that we initially tend to see the experts more like ourselves as more plausible and more expert. But hold on. Now there is the question of how the experts themselves behave. Kahneman claimed the intuitions/assumptions of the experts are more likely to be correct, because of their applied experience. So they would be closer to one another than the general population, not farther apart. What’s wrong with this picture? Is it that the experts on these questions are not as expert as they suppose? Is it that on these controversies the picture of one right answer is too simple? Is it a matter more of influence than of correctness? How interesting . . . The pair of Doc’s were discussing the double eontendre revolving around the true purpose and meaning of ‘sheepskin’? Germany’s legislature voted Friday to sharply cut back on subsidies and other financial incentives supporting green energy due to the strain wind and solar power placed on the country’s electricity grid. Survey results discussed in article: “The 7 biggest problems facing science, according to 270 scientists”. The money problem, poor incentives, lack of replication, “peer review is broken”, etc. Thanks for this link. Very interesting (and a bit depressing) read.